U.S. banks have recently rallied strongly and it’s worth considering if European banks can follow given relatively attractive valuations and an improving outlook. In this context I recently travelled to meet the senior management from all the major listed banks in the Nordic region. The trip increased my conviction around European growth and the prospects for gradual rate hikes over time; however I came away more cautious about Sweden which, like Australia, faces unique challenges associated with a booming property market. While closely managing our overall exposure given regional tail risks, we currently have investments in several banks in Europe (ex-Sweden) where we believe the market is currently under appreciating high quality deposit franchises which are leveraged to higher rates. 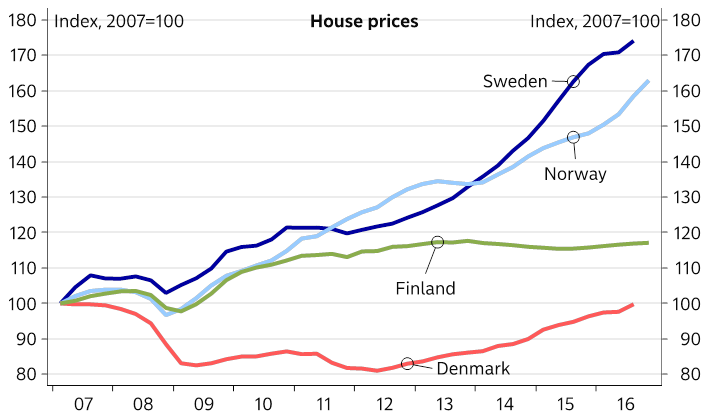 The region appears to be doing well, with Sweden especially strong recently led by personal consumption. Denmark is also beginning to grow again, although at a slower pace than Sweden; following a more severe housing correction in 2007/8, it seems that Denmark is several years behind Sweden in the recovery cycle. I was particularly struck by the parallels between Sweden and Australia, where both countries have a difficult political and regulatory debate around the risks posed by an overheated property sector. This was unquestionably the biggest theme of the tour, with every meeting discussing the property market in one form or another. There was a general consensus that the situation (especially in Sweden) was serious and posed potentially significant systemic risks for the broader economy; however given strong employment and low interest rates the probability of a severe correction in the short term seems low. While it was reassuring to find that all stakeholders in Sweden are focused on addressing property risks, initiatives to date appear to have had a limited impact. Regulators have released a series of macro-prudential measures and banks have all tightened mortgage underwriting standards – stress testing new borrowing at 8%, introducing a leverage ceiling of 5x and actively encouraging fixing rates (with limited success). These measures initially succeeded in slowing house prices, however it appears that prices have recently begun to accelerate again and the regulator is now considering further action including a 600% loan to net disposable income ceiling and possibly mandating fixed term lending for higher risk borrowers. There is also periodic public debate about removing the tax deductibility of mortgage interest, but like Australia this is a political hot potato and seems unlikely to happen. 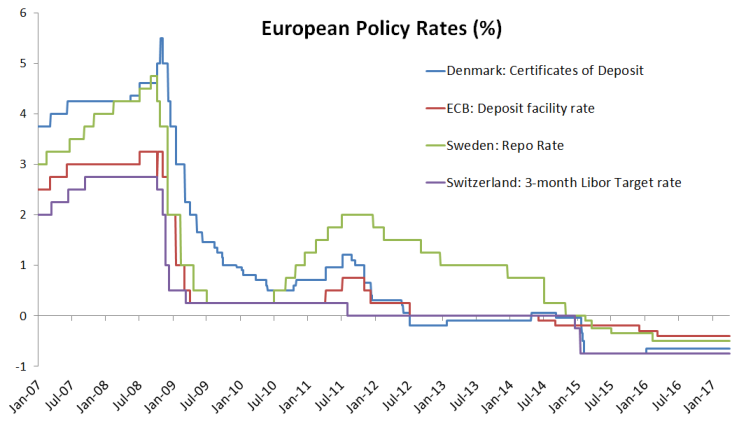 Sweden, like most of the rest of Europe, has had negative interest rates for several years. This has been a significant headwind for net interest income, however banks have generally adapted well – passing on negative rates to corporate and wholesale deposit holders, but protecting retail consumers. A rational oligopoly has also meant that the banks have successfully re-priced lending to reflect low/negative deposit margins as well as higher regulatory capital requirements. On the corporate side, explicit interest rate floors have been introduced. High loan-to-deposit ratios have also helped. Rate increases by the US Federal Reserve and improved growth mean that there is now a small but growing prospect of modest rate rises over the next 12-24 months in Sweden (and possibly Europe). In the very short run Nordic banks are unlikely to enjoy the same sensitivity to rising rates as Italian and Spanish banks, for the same reasons that they have been relatively resilient under negative rates (i.e. corporate rate floors and high loan-to-deposit ratios). Nevertheless, over time gradually higher interest rates would be a material positive for spreads, albeit potentially offset by slower growth and higher property related credit risks. Nordic banks have superficially high capital ratios; however this largely reflects low underlying mortgage risk weights (e.g. ~7% in Sweden given very low historic loss experience) and increasingly cautious pillar 2 regulatory overlays and management buffers to compensate for this. Over and above the clear systemic risk posed by elevated property prices, there remains a high probability of some form of risk weight inflation from pending regulatory reform (so-called ‘Basel IV’). At its worst (output floors of 80-90%) the sector could still face a significant potential capital shortfall; although a more benign (and more likely) outcome could see capital returns accelerate as the increased certainty allows regulators and management to reduce buffers. Nordic banks are generally viewed as either well worth the premium, or alternatively too expensive given the risks. My conclusion following the trip is that these are mostly strong franchises, which are well managed, thoughtfully regulated and, in Sweden, operate within a rational and shareholder-friendly oligopoly. This makes several of them potentially interesting investments although better entry points are likely to emerge as some of these property risks play out.